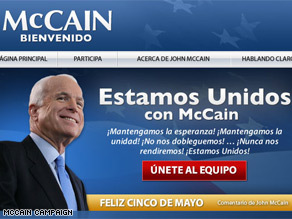 John McCain works to attract Hispanic voters. (CNN) - Sen. John McCain used Cinco de Mayo as a launching pad for a new Spanish-language Web site on Monday, and emphasized his stance on immigration and border security, hoping to attract Hispanic voters, a demographic which has become more important this election cycle. The presumptive Republican nominee, who represents a border state with a large Latino population, stressed the importance of securing the borders for the sake of national security, a priority he said Hispanics agree with, but he admitted the tone of debate has “harmed” the GOP’s image with Hispanic voters. “I think the tenor of the debate has harmed our image amongst Hispanics, [but] I believe the majority of Hispanics share our view that the border must be secured and the border must be secured first,” The Arizona senator said. McCain, who came under attack last year from some conservatives for his support of a bipartisan immigration bill, empathized with Hispanics who he said have often been mistreated. McCain also pledged to attend the National Council of La Raza's convention in July, the largest national Hispanic civil rights organization which seeks to improve opportunities for Hispanic-Americans. Asked if he would face criticism from his more conservative backers, McCain stressed his party is all encompassing. "We expect our president to be brilliant and learned, so should the voters." Have the last eight years taught you nothing? We expect our president to be "one of us." In the US today that means stupid, intellectually lazy and completely unwilling to learn about the larger world around him. But we would like to have a beer with him. MR John McCain has done more for hispanics than any other person running for office in Arizona ,my respect to mr mcCain.Give them hell McCain,God Bless.